Elinchrom had the Elinchrom EL-Skyport Transmitter Plus HS for Nikon, Canon and Sony cameras for awhile. This past September, during Photokina 2016, Elinchrom announced a new version for Olympus cameras. At the time, however, the system didn’t support the new Photokina-announced Olympus models or Panasonic Lumix cameras, which have been tied with Olympus since the companies invented the Micro Four Thirds systems. That all changes with the new firmware update, V.1.1. This new version adds support for all OM-D Olympus systems and Pen models, including the E-5 and E-410. It also adds support for Panasonic Lumix cameras going as far back as the G7 and including the Lx100 and FZ1000. The new compatibility means that Olympus and Panasonic cameras can use the Skyport transmitter to trigger and control Elinchrom flash heads. It can be used to control four groups of heads over 40 channels and a high-speed sync mode that allows shutter speeds as fast as 1/8000 seconds. According to Elinchrom, the system has an operating range of 200m and 2.4GHz radio communication signals. Here’s a table of Olympus and Panasonic cameras that are now compatible with the Skyport transmitter. For more details, here is the original press release from September for the EL-Skyport Transmitter Plus HS. Since the launch of the EL-Skyport Plus HS for Canon, Nikon and Sony, the most advanced EL-Skyport is now available to Olympus users. This will give photographers the ability to control and visualise power settings for all their compatible Elinchrom lights and gives them the opportunity to shoot at speeds up to 1/8000s in Hi-Sync mode. 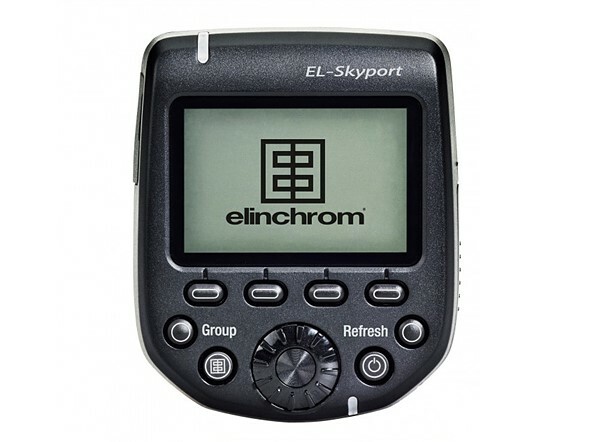 The Large LCD display of the EL-Skyport HS features two-way control via a visual feedback interface that lets you see the exact power up to 10 compatible Elinchrom lights in your setup, right on the transmitter. Users can control the modelling lamp and power of each flash unit directly from the EL-Skyport transmitter, which instantly shows the updated settings. This provides an incredible system for every light in your setup, right from your camera. Elinchrom Hi-Sync technology lets you go beyond the X-Sync of your camera. Photographers can simply switch to Hi-Sync mode and access sync speeds up to 1/8000s to freeze motion, overpower the sun, darken backgrounds or use a wider aperture. The ODS (Over Drive Sync) feature enables users to fine tune the EL-Skyport Plus HS transmitter’s trigger signal to optimise exposure at high shutter speeds whilst gaining up to 2 more f-stops of light. The EL-Skyport HS has 20 frequency channels that can be used for either Normal or Speed mode. The transmitter attaches easily and securely to the hotshoe with its quick-lock mechanism, and is powered by 2x AA batteries. Users can also enjoy a range of up to 656ft (200m) outdoors, and up to 196ft (60m) indoors. Other camera systems are currently being evaluated for future release. The EL-Skyport Transmitter Plus HS is now available for Olympus, Sony, Canon and Nikon cameras. Sync mode, group, channel, ODS activation, Hi-Sync activation, shutter mode, remaining battery power, flash unit name, flash unit ID, flash unit power level, flash unit modelling level. Group selection, test, rotation ring to change values, confirmation, on/off and refresh. Power +/-, Modelling lamp off/prop/free, Individual unit selection and setup on the dashboard. Menu up, menu down and exit in the setup menu. * See the list of compatible flash units and cameras.